Kyle Knits - a boy, his cats and way too much yarn: The Results! How Much Yarn you ask? I can now tell you. The Results! How Much Yarn you ask? I can now tell you. 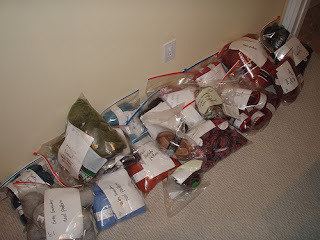 I also had 13 scarves ready to go - of course, none of these have patterns, but they're bagged and ready to go. In the blanket front (aside from the mitered square blanket) I have 2 collections of yarn that have been earmarked for blankets - one green blanket (in the big copper colored metal bucket) and that one has 46 balls of yarn... the other blanket is brown and other neutrals - including among others, my favorite yarn from Ozark Handspun, my cat and dog hair yarns that were made by vip fibers, and my own first attempt at spinning... this collection has 60 balls of yarn and is ready to go when I decide to get it going. 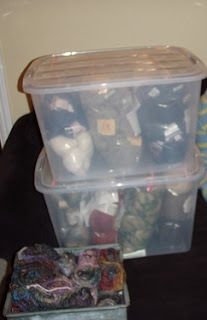 I haven't figured out what I want to do with these collections (what I want the pattern to be) - part of me thinks I might want to do something freeform, but I don't know for sure yet... the best thing to do when I don't know is to do nothing... so they sit. You will find my answer to your message on Ravelry, I've sent it a bit earlier today. That is A LOT OF YARN!! I think that much yarn would make me nervous. 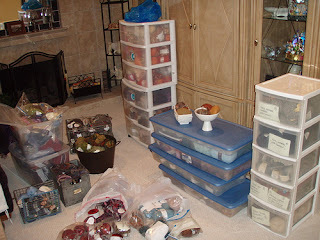 But, on the other hand, it also makes me nervous if my sock-yarn drawer isn't so full it almost won't close. I guess my nerves are pretty delicate. Now, stop playing around and get to work. With all that fibre you should have no trouble producing wonderful works of art on a regular basis. thanks for the game- that was fun! My goodness! I don't feel so bad now! 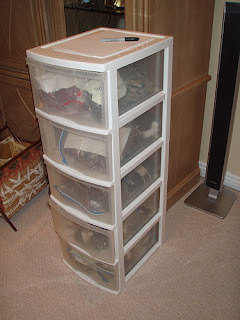 :) That's a nice collection you have going! Again, thanks for the gifts you sent me!